With just eight days left in this food challenge, I feel like we're definitely getting the hang of it! I'm being more intentional about menu planning, I'm spending less at the grocery store, and we haven't eaten out at all this month. I feel very proud of the progress we've made, and I'm confident that we can carry on with the things we've learned. As I mentioned last week, we planned to spend the week's food budget on our bulk foods delivery (which arrived on Friday). I ended up spending $43.40 on bulk foods, which brings the total for the month so far to $148.13. Last week's tasks were fairly simple: to spend no extra money on groceries since I was purchasing from the bulk foods delivery, and to eat more foods from the freezer and pantry for daytime meals as well as dinners. All of these goals were met this week, and I was surprised that we could go for so long without buying any food at all! This week I watched an episode of Extreme Couponers (we don't have cable, so this is the first time I've even heard of this show). I could relate to the feelings that the show's participants expressed about why they've come to keep so much food in the house. I want to be clear that while I have used the word "hoarding" to describe my tendencies with food, my food stockpiling is not at ALL to the level featured on that show (perhaps in part because I don't have those kind of money-saving skills). I understand completely how those people ended up with food lining every wall of their home, because like them, I've been in a place in the past where I worried whether I would be able to afford food. It's not a good feeling, and I know it's one that many people all over the world feel every single day. Which brings me to the second thing that's come up this week: restricting food intake. As I checked in with Jaymz this week about how the challenge was going for him, he admitted that he's feeling a lot of pressure from this experimental budget to not eat as much as he normally would, so he's been restricting his intake. I too, have been feeling the pressure to consume less and save more from this (for us) very restrictive budget. I didn't expect this kind of result from simply trying to eat more of the food we already have, and I'm rather disturbed by how quickly we both have reverted to this kind of "survival" type thinking when it comes to conserving food. I'm definitely finding it more difficult to follow my body's lead and eat intuitively when I'm constantly thinking about how much each food item costs. Going into this, Jaymz and I chose the $200 figure basically out of thin air, since we haven't ever kept to a food budget before, and it seemed like we had plenty of food. That translates to $2.22 per meal (for all three of us), or $2.22 per person per day. That's 74 cents per person, per meal. If I include the snacks that we all have throughout the day, the figure gets even more difficult to wrap my mind around. In practice, this limit we set is simply not manageable for our family if we eat as much as we want. While we do have a fair amount of food stored up, the majority of it is uncooked grains (such as rice, oats, and flour) which require other ingredients to make them tasty, filling, and more nutritionally dense. As I've bought groceries this month, I'm mostly purchasing produce, eggs, milk & cheese, and a little bit of meat—and much less of all of these than we're used to. I know that far too many people (perhaps including you, dear reader) live on spending this much or less for food, and that's just not right. In light of the fact that these are self-imposed budgetary limits and Jaymz and I are finding ourselves feeling fairly desperate about food lately, I'm going to be more flexible with the budget for the last week. We will also come up with a more realistic budget for future months. The bottom line is: I'm not willing to give up on well-rounded nutrition or to start feeling like I have to eat less so that we'll have enough for Daniel to eat, just for the sake of sticking to a budget and using up food we already have. And, I want us to be able to stick to the second of the rules I outlined for the challenge: Eat as much as we want. Right now we're not doing that, and it feels bad. Stop restricting food intake! This is the main task for the week and it's essential that we focus on it to change this frame of mind we've slipped into. Thanksgiving on a budget: Make as many of the dishes I had planned ahead of time as I possibly can while attempting to stay within my budget. This includes a roasted turkey breast, yams, gluten-free stuffing, mashed potatoes, green bean casserole, and egg casserole for breakfast. Make enough food to last through the early part of the week (but not too much) so the Thanksgiving food leftovers will be able to carry us through the rest of the challenge. 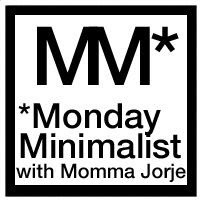 I was inspired to create this food challenge (in part) by Momma Jorje's Monday Minimalist series. I'll be participating in Monday Minimalist for the Mondays in November, writing updates on our progress. Head on over and grab Momma Jorje's brand new MM button! I just stumbled onto your blog and it is really neat. I commend you for your challenge of $200 for a month. That amazes me you've been able to do that since that is about 2 weeks of food money for my husband and me. Our food budget that has worked amazingly for almost a year, is that we put $100 in the kitty for each week. Luckily, we used to get paid every other week where one of us got paid and the other did the next week. This really helped us become mindful of our spending habits and reduced arguments over "who pays next." We have found that we spend a lot less than $100 each week plus we eat out less because we are more mindful of costs. Also, we make casseroles on Sundays so that we can just eat them throughout the week so when we don't feel like cooking, we can just reheat and eat something healthier than take out. Then the extra money is used for our BJ's run of bulk materials. We also used all the extra money on our honeymoon which helped out a lot! The only some issues is that during the year, I don't have energy to cook or get stressed out and we order out or go out. Weekends are a struggle too sometimes. The last issue is that neither one of us carries cash around so we are still constantly forgetting to get the money to put in the kitty. I hope you find a way that doesn't stress your family out about food and are able to curb costs in your household. This is so interesting, because we're having the same problem with restricting food intake. Due to some potential business changes, we've been nervous about our income continuing as is, so we've resolved to scrimp for awhile so we can save up a nest egg. That means we've been really conscious of what we eat and how much each bite costs, and the food restriction has been an unfortunate byproduct. For instance, yesterday we ate breakfast and then knew we were going to go out for lunch. (I realize going out isn't all that frugal, but we allow ourselves a couple cheap places a week. Mama needs to get out of the house once in awhile.) But then the baby napped and we didn't end up going out till much later, actually dinnertime. Once we got to the restaurant, Mikko was in a mood where he was breaking down crying at everything and I was snapping at him — until we got some food in us. It turns out that when Sam and I don't feed ourselves, we're also not so good at keeping the kiddo fed! Major parenting fail. I'm not saying Mikko didn't eat or snack during the day, because he did, but less than he normally would have — obviously, given his fragile state by dinner. Anyway, it's been illuminating, and we can see what changes we need to make. I'm sure today (Thanksgiving), no one will go unstuffed, lol.